This confession came in spite of my sweet friend’s burgeoning track record helping troubled couples that God placed in her path. My heart ached for her, because it seemed so clear to me that she was supposed to do the very thing her heart was drawing her toward. Yet that awful feeling of unworthiness told her that she couldn’t possibly help anyone. After all, she had done so many things wrong. And I so get that. I think we can all relate to feeling unworthy to something God has called us to do. Yet when we experience a deep sense of unworthiness, it’s a sign that our focus is wrong. Because ministry of any kind is not dependent on our worthiness, but His. When our focus is on us, we to lose sight of God’s magnificent grace. We see only our own blemishes and faults and all the reasons we can’t. But when our eyes are on Him, when we dare to trust that He knows what He’s doing, we’re free to believe He can accomplish the seemingly impossible through frail, clumsy, imperfect vessels. Because really, that’s what we are. And that’s okay, because that’s all God requires: A willing heart, poised and ready to believe that in spite of our imperfections, He can still use us. 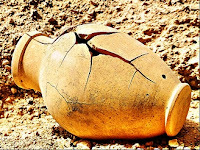 It’s a divine mystery: God chooses to use chipped, leaking, busted pots. I don’t know what dream you might have put on hold because you don’t feel worthy. But if we’ve asked the Lord to forgive us, He has. And maybe, just maybe, we need to consider the possibility that we need to forgive ourselves. The truth is, people relate much more to our brokenness than to our so-called perfections. And so we are free to stumble forward, hearts poised to help those He sends across our path in whichever way He leads us, trusting and believing that in spite of our imperfections, He can still use us. Not because we’re worthy. Because we’re not. But He is. Thank you for this, Julie! As usual, you struck a cord. God has been showing me over and over recently that I don't really understand His love and grace like I should. It's nothing we've done, completely undeserved. It's all about Him. Thank you for pointing out our focus on the wrong person and our need to forgive ourselves. Good! Such an important truth, Julie -- one that I'm sure we all need to reminded of time and again. Love how you pointed out that people identify more with our brokenness than with our so-called perfections. You put this in wonderful perspective. When I was asked to buy a Christian bookstore as a ministry I wanted to say no, I didn't read the books, I couldn't witness etc. But my wonderful partners reminded me it wasn't about me--it was about God who would do it all through me. Great post Julie! Echoes a message I've heard twice in the last two days!! Guess it's what I need to hear!! Your closing reminds me of Whitney's talk at She Speaks! Saturday night my husband and I went to a Jason Gray concert - if you ever get the chance to see him, GO!! Anyway he touched on this as well and shared about it from another angle too - he would often go to God in prayer before going on stage with these words, "Father, I know I'm not worthy, so use me, speak thru me..." But God eventually spoke to him and used his kids. They didn't do anything to be born into his family or earn his love, but how would he feel if they constantly came to him saying, "Dad, I know I'm not worthy, but..." God doesn't need us doing that either. I guess for me it put things into a different perspective and reminded me we must always remember who we are!! Wow... needed this one today! You've ministered to this mother's heart. Been a rough day, but it's finishing nicely. Hey, when is your book coming out? I'd love to do a blog post on it and a give-away. In addition, if you move over to Wordpress, I can't say enough about Jen at Blue Yonder. I had so much trouble with my last design, I had to start over. Wish I had known about Jen from the start. Thanks for the reminder that our ministry is dependent on His worthiness, not ours.